Naturally we have people cursing BCCI and the Indian cricket team left, right and center for all evil that exists in this world. I’m a staunch advocate of the DRS and I have also been culpable of taking a dig at the BCCI at any given oppurtuniy. However there is some merit to what the BCCI is opposed to and maybe Srinivasan is not as eloquent as he should be to address the issue. There is no doubt that the DRS in the present form is completely flawed and in this piece I’m trying to possibly decipher the opposition for DRS. 1) The lack of hot spot cameras to detect edges. 2) The anomaly that exists which is called ” The on-field decision stays”. 3) ICC not taking up ownership and the cost of the DRS system. The lack of hot spot cameras to detect edges should be the basic requirement to eliminate howlers. It’s virtually impossible to detect fine edges without this and the DRS of today does not have hot spot as a mandatory requirement.The reason being that the technology is not cheap and when ICC does not foot the bill and asks the home boards to pay for that, most of them do not want to do that for these cameras are really expensive. TV deals are already worked out and the broadcasters are reluctant to shell out more money to invest in the technology. Just to put some numbers It costs $6,000 per day for a two-camera setup and $10,000 per day for a four-camera setup. In addition there are only a very few cameras in the world today, The reason being these cameras require security clearances from various governments, which can take up to three months to complete since they are classified as military equipment. So I wonder which board would want to go through all these red tape and hassle to put these in place. An example of the administrators taking ownership is the “Chase review system”used in the U.S.Open Tennis tournaments, where Chase pays the money as the sponsors of the system and USTA does not need to shell out from their own pockets. ICC should adopt such a policy and take ownership through sponsors so that the national boards are taken out of the picture completely. I would seriously doubt if BCCI would oppose a system if ICC owns and implements it. For all the opposition they are making about the DRS, The system was in place in the World Cup and they still used it. The obvious reason being ICC owned it. Of course we could argue that howlers will be eliminated with the DRS even without the hotspot in it’s present form. Agreed, but teams like India might think that any decision an umpire makes will probably favor them in the long run without DRS or it will even out at the end. This is obvious because India is a top ranked side and naturally umpires think twice before making a decision against a top side. Not so long ago we had umpires making errors in favor of Australia and they were never open to DRS when they were the dominant team. Thirdly The anomaly that exists in the system today should be rectified. There are some serious gaps in the way the system is defined when it comes to the on-field call, If we are using technology it’s either out or not out.Simple binary, Why have a human element in the mix? Potentially a dismissal or a non-dismissal could have two possible outcomes based on what the on-field umpire calls. decision still stays not out. This is nothing but a classic case of a system failing for the very purpose it was designed. Either accept the technology or do not, trusting the technology when it suits you will not work. 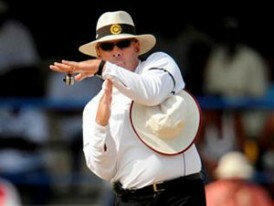 The DRS is certainly a great tool the onus is on the ICC to make it successful.